It is impossible to imagine it today, but there was once road traffic without traffic lights. Around 1900 the traffic density and speed in towns and cities were already becoming dangerous – so a technical solution was sought. The first experiments with light signals failed dramatically. In London, a gas-operated signal system was installed in Parliament Square on December 10th, 1868, using the colours that are still in effect today: it was the world’s first attempt to control road traffic using light signals. But the lights exploded even before the coachmen and the first car drivers could become familiar with the new system. The experiments in the USA were more successful: the first electrically-operated traffic lights in the world, with green and red coloured light bulbs, were installed in Cleveland, Ohio on August 5th, 1914. A media overload, an airport being built, chaotic road traffic. Sounds like Berlin today? No, this was Berlin in 1924. 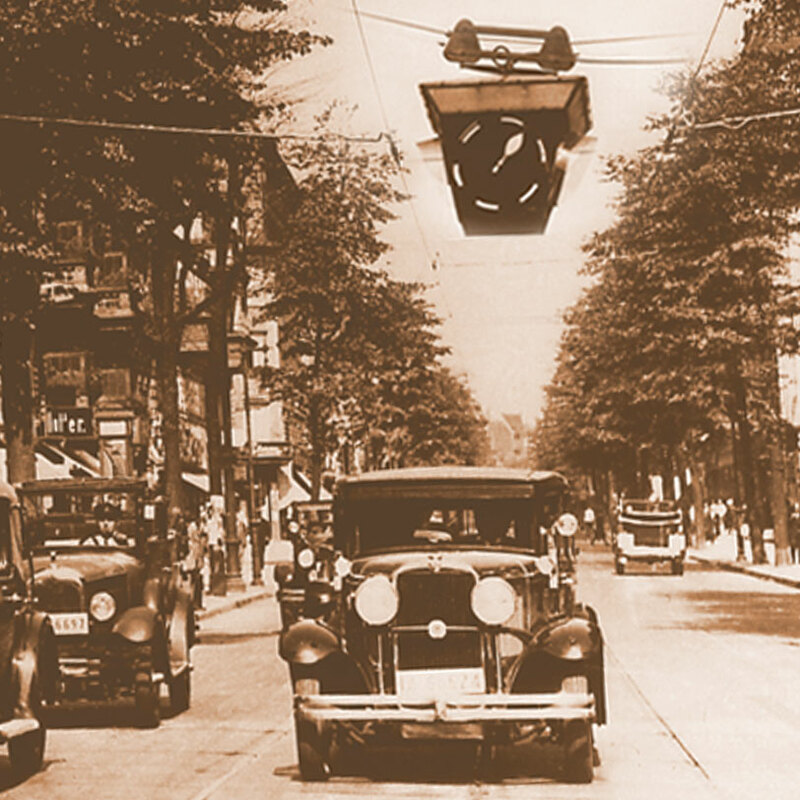 During the 1920s and 1930s, the city of Berlin was the center point for technology enthusiasts. Road traffic grew at a rapid pace too. Potsdamer Platz was a crossroad with more traffic than any other in Europe. The traffic jams were growing longer all the time and there was a significant number of accidents involving pedestrians. Every day 83,000 passengers used the overground and underground station at Potsdamer Platz alone, not to mention more than 20,000 cars, 26 tram lines and 5 bus lines. The police (carrying trumpets) was struggling to keep this chaos under control. 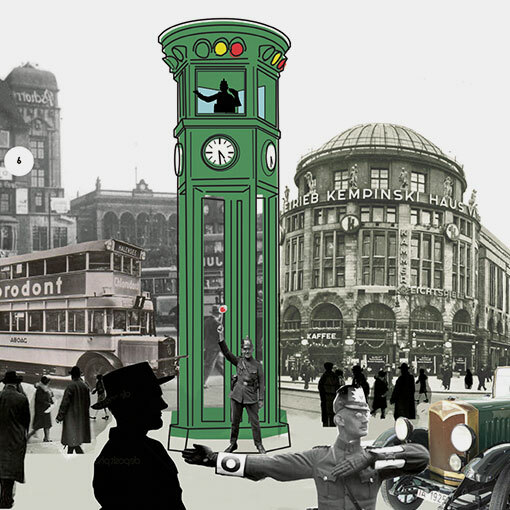 Consequently, in 1924, the first traffic lights in Berlin were ceremonially put into service on Potsdamer Platz. The signals in the over eight-meter-high signal tower were controlled by a policeman sitting in his protected cabin. 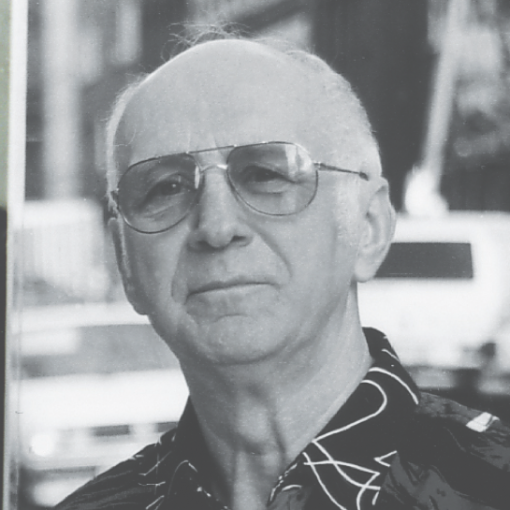 But pedestrians did not accept the signals quite as quickly as the car drivers, and continued to walk diagonally across the square – which was maybe typical of Berlin? The principle behind the traffic lights became established. The famous five-sided green signal tower on Potsdamer Platz remained in operation until 1936, and became an emblem of the city. Today, Berlin has brought it back: since September 2000 a replica of the first Berlin signal tower at Potsdamer Platz has been there to be admired by everyone. With its clocks on all five sides, which were also important at the time, it points in all directions just like the original. So today, as it was back then, the green signal tower is a landmark for Berliners and visitors and a reminder of the city’s history. 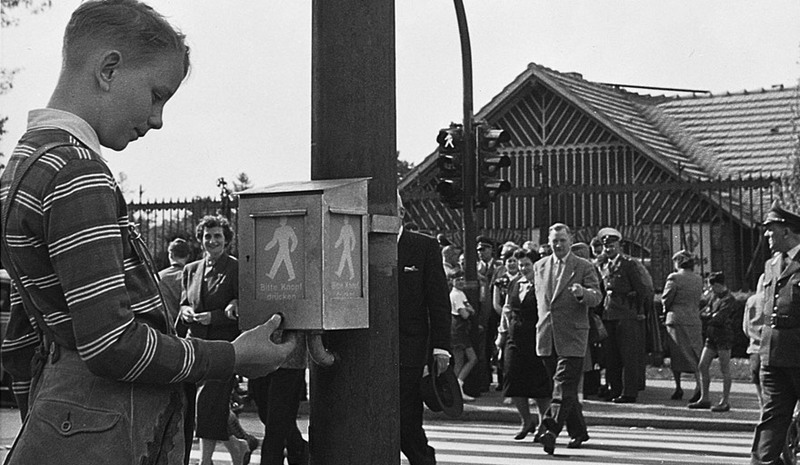 In Copenhagen, the first traffic lights especially for pedestrians were put into service. In Berlin, scaled-down vehicle traffic lights were equipped with green and red lights and used for pedestrians (but not yet developed especially for pedestrians). In New York, the first pedestrian traffic lights were installed, bearing the words “Walk” and “Don’t Walk”. In Germany too, lights with “Wait” and “Walk” were occasionally used at traffic lights. Symbols were developed for traffic lights in many countries independently of one another, usually in the form of little people. Thereby, the first Ampelmännchen were created in a variety of versions worldwide. But no other symbol was preceded by such extensive, well-founded development on the basis of traffic psychology as the famous East German Ampelmännchen. 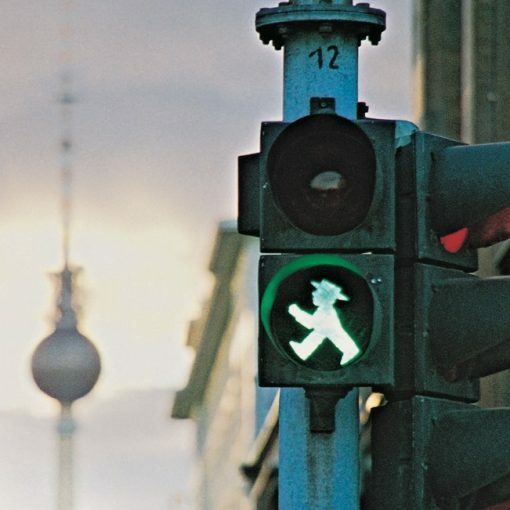 No other traffic light symbol in the world was as carefully developed, from both technical and psychological aspects, as the East German Ampelmännchen.